In terms of wine, Grand Cru refers to the highest level of classification, but we don't see why we couldn't use the term to classify this fantastic sailboat. With 5 cabins and 4 bathrooms, the Grand Cru offers ample space for families or groups of friends. 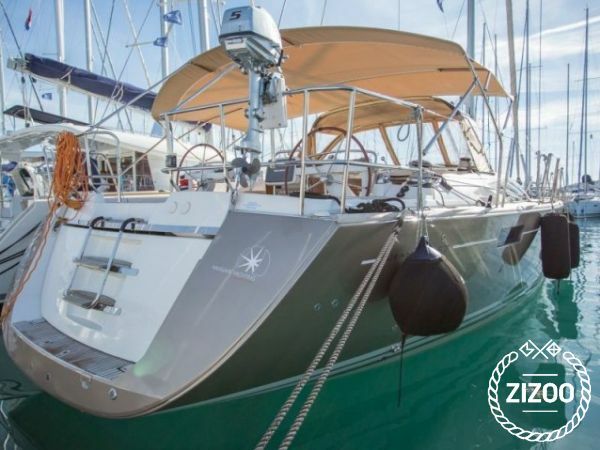 This 2012 Jeanneau 57 Performance cruiser is harboured in Kastela, a picturesque region northwest of the historic town of Split. With a long sandy beach and numerous sporting grounds, Kastela is a great place to start your holiday, though we recommend you do take advantage of the open sea and explore the thousand islands scattered over the Adriatic. From quiet bays, to private beaches to some of the most exciting nightlife, there is plenty of freedom to change your mind and do what suits your mood. So if it's a lovely dinner in a quaint seafood restaurant, or a morning stroll on one of Croatia's many beautiful boardwalks, be sure to consult with your designated crew, who are there to help make your decision a bit easier. we will return in Trogir ! rat living on the boat..